It is with great reluctance that I'm selling my Rudolf Meinl four-valve 5/4 BBb tuba. I purchased this horn from Baltimore Brass back in October for $7,500; if I remember correctly, they said the horn was made sometime back in the 1970s. The lacquer shows that age in certain places. There are a few dings and a dent on the bottom bow that doesn't affect the playability of the tuba in any manner. Derek Fenstermacher of NJSO and Albany Symphony Orchestra play-tested this tuba and said it's one of the good Rudy's. He even said he'd be inclined to ask to borrow the tuba for Prokofiev 5. There's immense sound in the low register and a nice, resonant upper register. This tuba is one of the most air-efficient tubas I've ever played; a little air produces a truly beautiful sound that worked in many settings for me, including orchestra, wind ensemble, brass quintet and solo work. I'm asking $6,000 for this tuba plus shipping via Greyhound from Kingston, NY, though I am willing to hear reasonable offers. It will come with a relatively new 1209v MTS tuba case that's had the mouthpiece box removed, as that's the only way it could fit. Last edited by Tubanomicon on Fri Nov 02, 2018 6:29 pm, edited 12 times in total. Bump. I told Derek Fenstermacher that I'm selling this horn. He said he wished he had the funds at this time to buy such a "dark" horn. Beautiful horn, what model is it? 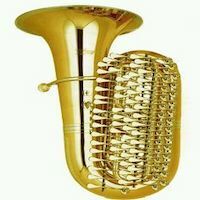 Antontuba, it's the Bayreuth model. And thanks for the kind words. You should see it in person. It's magnificent. Tubanomicon wrote: Antontuba, it's the Bayreuth model. Beautiful, lovely tuba no doubt. If made in the 70s it can't be a Bayreuth model though as they didn't start making them until much later right? You're right, Peach. My apologies for the confusion. I could definitely brush up on my RM lore. Willing to hear reasonable offers.